Groups troop to Camp Crame the day after Baylosis' arrest. Photo by Kathy Yamzon. “Indeed, it is extremely provocative that the armed minions of Duterte arrest NDFP [National Democratic Front of the Philippines] consultants like Rafael Baylosis who are protected by the Joint Agreement on Safety and Immunity Guarantees (JASIG),” said NDFP Chief Political Consultant Jose Maria Sison in a statement posted on his website on February 4. 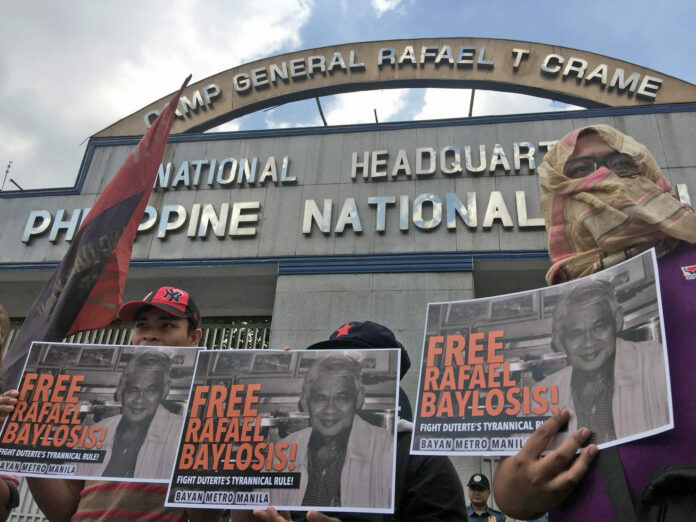 Baylosis was arrested together with Guillermo Roque on Wednesday last week in Quezon City by joint forces of police and military operatives. The two are currently detained at the headquarters of the police Criminal Investigation and Detection Group (CIDG) in Camp Crame in Quezon City. “As NDFP Chief political consultant I advice the NDFP to recommend to the CPP [Communist Party of the Philippines] and NPA [New People’s Army] to respect the JASIG as a solemn agreement that protects the negotiating personnel of both the NDFP and GRP. The GRP side, especially Duterte, should cease and desist from arresting NDFP negotiating personnel and from violating the JASIG. It is good to keep open the possibility of resuming the peace negotiations rather than violate the JASIG and undermine confidence in the peace process in a long lasting way,” said Sison. Sison said that with or without Duterte as president, the GRP will decide to negotiate peace when the people´s war can inflict larger casualties on enemy troops. The NPA, according to Sison, has the capacity to eliminate one soldier per region everyday, numbering to 510 troops or five companies nationwide every month or 60 companies or 20 basic battalions every year. On Monday, Casilao clarified his statement. “My statement on the matter was a well-meaning concern and does not carry a shred of hostility towards the GRP panel and its staff. In fact, it’s a call for both parties, the NDFP and the GRP to resume the peace talks to address the root causes of the armed conflict. Likewise, it was urging both parties to continue to respect previous signed agreements particularly the Joint Agreement on Safety Immunity Guarantees (JASIG) which gives both NDFP and GRP negotiators, along with its respective staff protection from arrest, harassment, filing of complaints and among others” Casilao said. “The fact is that since Teroy Llamas was arrested in May 1995, right after the JASIG was signed and on the eve of the opening of formal talks, the GRP has continually illegally arrested and detained scores of NDFP Reciprocal Working Committee (RWC) members, consultants, staff and other JASIG-protected persons and the NPA has never retaliated by arresting GRP negotiators, consultants or non-combatants for that matter,” recounted Rey Casambre of the Philippine Peace Center. The NDFP recounted cases of JASIG violations by the GRP: Sotero ‘Teroy’ Llamas was NDFP RWC member when he was assassinated by GRP security forces in April 2007. NDFP consultant Eduardo Serrano was illegally arrested in 2004 and died while under detention in December 2015. Despite these, the group was observed to have never issued a statement threatening to retaliate by arresting GRP negotiators. “During the inquest [on February 1], suddenly a hand grenade decided to come out of thin air. So the false charge was not only illegal possession of firearm which is bailable. Now to make the case non-bailable, the gun decided to give birth to a hand grenade, an item which was not mentioned in the police spot report issued earlier,” continued Olalia. Olalia also relayed that the Manila Regional Trial Court Branch 32, the court ‘hearing the false charges of murders against him and others’, denied the earlier motion of the prosecution to cancel his bail and order his rearrest. “So the only basis for his arrest was the concocted story that a known 69-year old peace consultant was swaggering around a busy city street with a gun in his waist and a grenade ‘associated’ (the police’s term, not ours) with the brown rice he was holding. What a way to plant and cook evidence,” rounded out Olalia.